The following is a manifesto of all military equipment in usage by the Spredronian armed forces (excluding UTSO firearms). P-57 - One of the standard pistols, a Last Resort, quick-draw weapon. Ammo capacity over P-45. P-45 - The other standard pistol, a last resort, quick-draw weapon. Kinetic damage over P-57. P-92 - A former standard pistol, still in use today. By executive order, the P-57 has outmoded this weapon. P-19 - A former standard pistol, that is also still used today. By executive order, the P-45 has outmoded this weapon. PDW-9 - One of the standard PDWs, commonly used to fend off enemies in extreme close quarters. Fire rate over PDW-90. PDW-90 - The other standard PDW, used as an intermediate that is not quite a PDW, and not quite an SMG. 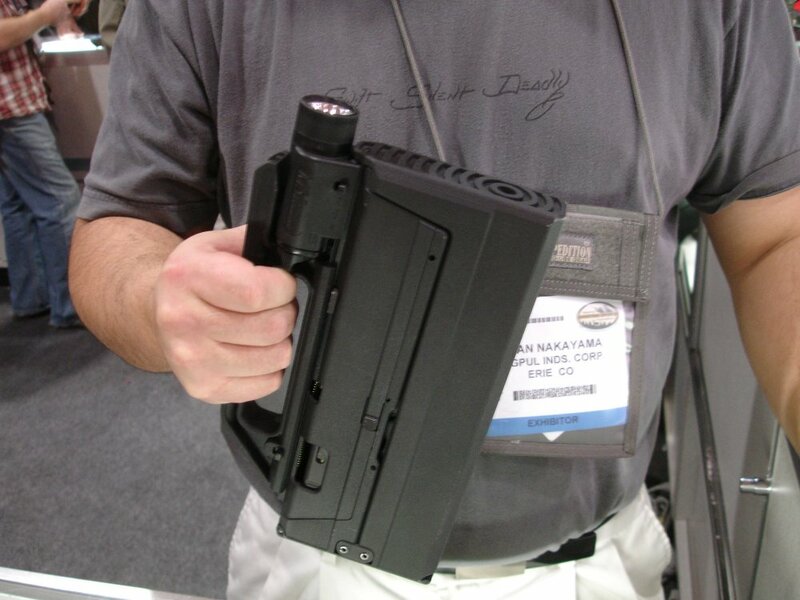 Magazine capacity over PDW-9. PDW-18 - The former standard PDW, which is still in usage today. By executive order, the PDW-18 has been outmoded; its parts are still used in the PDW-9, however. SMG-901 - One of the standard SMGs, used when ranged firepower is required, but overpenetration is an issue. Magazine capacity over SMG-1928. SMG-1928/SMG-11 - The other standard SMG, used in the same situation as the SMG-901./The SMG the SMG-1928 outmoded, otherwise nearly identical to the former. SMG-192 - The former standard 9mm SMG, which is still in usage today. By executive order, the SMG-192 has been outmoded. AR-68 - One of the standard ARs, the default weapon for the military. 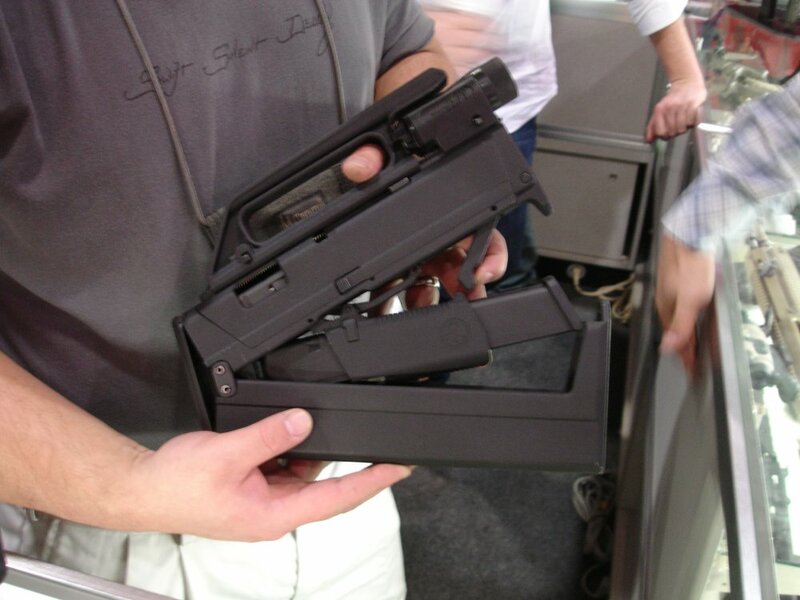 Magazine capacity over AR-58. AR-17 - The other standard AR, used when heavier firepower is required. Damage over AR-68. The P-57 service handgun, shown surrounded by 5.7x28mm cartridges it utilizes. The P-57 service handgun, again, surrounded by 5.7x28mm cartridges, equipped with a Tactical Flashlight. The P-57 service handgun, again, surrounded by 5.7x28mm cartridges. Smart soldiers do not leave their ammunition lying around. The photographer probably missed a few pointers. The P-57 is one of the standard issue service pistols of the Spredronian military, the other being the P-45. Named because it is a pistol chambered for 5.7x28mm rounds, the P-57 is accurate to within 50 m, with a maximum range of 1,510 m (though hitting your target within that range is a challenge in and of itself). The gun can feed from two magazines - a twenty-round magazine that fits flush with the grip and comes standard, and a thirty-round extended magazine that is available on request to Rangers and Marines. The gun uses a partridge-style sighting system with dot illumination sights to assist low-light shooting. As can be expected, the gun fires semi-automatically only. Recoil is negligible. The weapon has a single underbarrel rail to accept pistol attachments, and can have a sound supressor affixed to the barrel. The weapon has outmoded the previous low-caliber standard-issue handgun, the P-92, because of its improved capacity and ability to pierce light body armor. The P-45 service handgun, shown here in the latest soldier trend surrounded by .45 ACP rounds it utilizes, equipped with a Tactical Flashlight. The P-45C service handgun, similar to the standard P-45, but with a shorter barrel. P-45Cs are available on request to Rangers and Marines. The P-45, standard-issue, with no attachments. The P-45 is one of the standard issue service pistols of the Spredronian military, the other being the P-57. Named, like the P-57, because it is a pistol which fires .45 ACP rounds, the P-45 has an effective range of 30 m, less than the P-57, a trade-off for the higher caliber and impact power the P-45 can apply. The gun can feed from two magazines - as with the P-57, a flush-fitting standard magazine (fitting 12 rounds), and an extended magazine on request for Rangers/Marines (which fits 20 rounds). The gun uses a partridge sighting system - again, using tri-dot illumination to assist firing in dark environs. 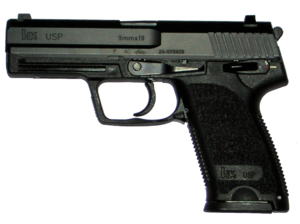 The USP is a semi-automatic pistol only. Recoil is controllable. As with the P-57, the P-45 has a single underbarrel attachment point, and a barrel tuned to accept sound supressors. The weapon has outmoded the previous high-caliber service pistol, the P-19, because despite the additional weight, the increased carrying capacity was considered to be an acceptable trade-off. The P-92, shown here as issued, with no attachments and a tactical rail cover. A side profile of the P-92, also standard-issue, also using the rail cover. A P-92 next to its case, once again without attachments and using a rail cover. The rail cover when nothing is being used is commendable. The weapon not having at least one thing tacked onto it... debatable. The P-92 is a service pistol of the Spredronian Military that is being phased out. Following naming conventions, the P-92 was named for its pistol frame. The 92 designation was inspired by the gun's submission designation of 90two. The gun feeds from 9x19mm Parabellum rounds - these rounds have less kinetic impact force than 5.7x28mm rounds, and lack natural armor-piercing capability, one of the reasons the weapon is being phased out. The P-92 is accurate to within 50 m, the same as the Five-seveN - another reason it is in the phase-out process. The weapon feeds from two magazines - a 17 round magazine that comes standard with the gun, and a 25 round extended magazine available on request to Rangers/Marines. The gun uses a partridge sighting system with "sight lights" to assist dark targeting. Of particular note, and the reason why the weapon is slow to phase out, is because of its interchangeable polymer grips - multiple grips are available, and can be detached and attached at will to suit hand size and shape, for maximum comfort. The comfortable, ergonomic grip has made many veteran soldiers stick with the P-92 instead of switching to the P-57. The weapon, like the P-57, has an underbarrel rail to accept attachments. While the weapon is being phased out, it will continue to be supported until working copies are no longer present. A P-19, shown here with a Tactical Flashlight mounted under the barrel. A variant of the P-19, complete with an older variant of the Tactical Flashlight mounted on the same spot. 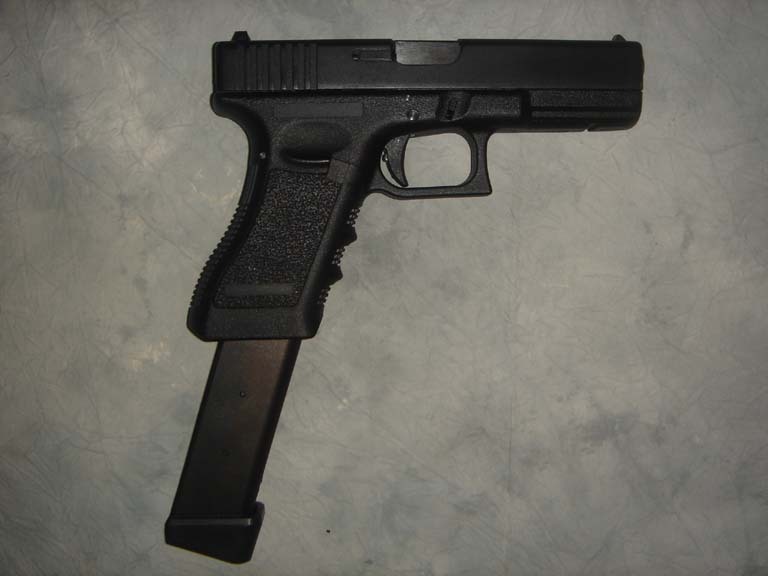 Yet another variant of the P-19, shown without any attachments. For once, the user has probably decided the tri-dot sights are good enough for night fighting. The P-19 is a service pistol of the Spredronian military that is being phased out. As per the status quo of firearms naming, the P-19 was named for its status as a pistol (hopefully, not to be reclassified), with "19" being the two numbers of the handgun it was based on - the Model 1911. It feeds on the same .45 ACP rounds as the P-45. The gun has a larger effective range than the P-45 - 70 m of accuracy - which means that although it is being phased out, most soldiers prefer it due to its higher range. As with all other pistols, two magazines are available - a seven-round flush-fitting magazine, standard-issue, and a 14-round extended magazine available on request to Rangers/Marines that wish for extra bang. One of the reasons the weapon is being phased out is because of its lower magazine capacity. The gun uses a partridge sighting system, with tri-dot sights to help shoot in the dark (actually acquiring a target is another problem). The gun can attach some underbarrel attachments under the slide and frame, and as with the P-92, will continue to be supported despite being phased out until there are no working copies in the military. A technician carrying the PDW-9 in folded form. The weapon comes standard with a carry handle containing iron sights and a Tactical Flashlight. The same technician unfolding the PDW-9. Note the internals and what appears to be a PDW-18 housed inside the weapon; this is a modified variant designed to fold with the weapon. The unfolded PDW-9. Unfolded, the weapon has a vertical handle near the front and an extended backstock to control the weapon. The PDW-9 is one of the standard-issue personal defense weapons of the Spredronian military, the other being the PDW-90. Named because of its military classification as a personal defense weapon, the PDW-9 is also named for the 9x19mm Parabellum rounds it feeds from. The PDW-9 has an effective range of 50 m - though it was envisioned as a personal defense weapon, so this does not matter much, as engagements are expected to be conducted at "knife fight" range. The gun can only feed from the 33 round magazine included as standard, due to the folding mechanism requiring the modded PDW-18's "shell" to fit inside the gun - along with the magazine. The weapon uses partridge-style tri-dot illuminated iron sights, and fires at a rate of 1200 rounds per minute, or 20 rounds per second - operators are encouraged to fire in short bursts. A semi-automatic mode is available for those who want to control their shots. The weapon unfolds utilizing a button on the receiver, and the carrying handle - along with the Tactical Flashlight - is attached to an accessory rail running the length of the top. The carry handle may be switched out for an optics system, but due to its intended purpose, supressors are available only to UTSO soldiers. The PDW-9 has outmoded the previous service model, the PDW-18, due to its higher level of controllability (though the 18 lives on as the "core" of the gun; as mentioned in the caption, the internals are based off of it). The PDW-90, shown here with a Sound Supressor attached to it, but curiously lacking iron sights. The PDW-90 as issued. The top accessory rail lacks iron sights - Rail-Mounted Iron Sights are available to attach. A customized PDW-90, equipped with a Reflex Sight optic, a Tactical Flashlight, and a Sound Supressor. The user of the top PDW-90 could stand to learn a few lessons from this guy. The PDW-90 is one of the standard-issue personal defense weapons of the Spredronian miliitary, the other being the PDW-9. As with the above weapon, the PDW-90 is named because of its classification as a personal defense wweapon, with the 90 being assigned based on the submission variant of the weapon - the P90. The PDW-90 can fire accurately up to 200 m, and the bullets can fire 1,800 m maximum - though, even if you mounted a ballistic scope, hitting a target at that range would be like shooting a needle out of a haystack. The PDW-90 feeds from the same 5.7x28mm rounds the P-57 uses. Thanks to the unique horizontal magazine mount that allows the PDW-90's compact size, it can only fit a 50-round magazine - no extended magazines are possible to fit on the gun. The weapon has no built-in iron sights, instead using rail-mounted iron sights as default, and fires at 900 rounds per minute, or 15 rounds per second - as with the PDW-9, a semi-automatic mode is available to conserve ammunition and fire more controllably. The PDW-90 carries three accessory rails - an optical rail mounted on top of the gun, and two side rails that can accept a Laser Sight and Tactical Flashlight. The barrel can also have a supressor fitted onto it due to its increased range. There is no weapon the PDW-90 has outmoded; it occupies a unique niche in the miltary as an intermediate PDW, with less range than the sub-machine guns used, but more portability. A PDW-18 equipped with the standard 33 round magazine. Two PDW-18s side-by-side, viewed from the top. Note the illuminated iron sights, the notch in the slide that reveals the barrel, and the ejection port. A PDW-18 carrying a 20 round fast-loading magazine, and a Laser Sight under the barrel. The slide is cocked back. The PDW-18 is a service personal defense weapon of the Spredronian military that is being phased out. As the prophecy demands, the PDW-18 is named for its classification as a personal defense weapon (being a machine pistol), and for the numeric designation assigned when it was submitted - the Glock 18. It feeds on 9x19mm Parabellum rounds, and has a range of 50 m - the same as the PDW-9, meaning the new matches up to the old. The gun can feed from three magazines - a 33 round magazine included as standard, a 20 round Fast Loader magazine, and a 100 round Twin-Drum Magazine available on request to Rangers and Marines. The weapon uses illuminated partridge sights, and fires at the same speed as the PDW-9; 1200 rounds per minute, or 20 rounds per second. Being a pistol, control (and a polymer backstock) are usually advisable add-ons. The weapon has an underbarrel rail available to accept attachments. Like some other outmoded weapons, however, the PDW-18 will continue to have parts manufactured for it - this oddity coming because while the gun is no longer being issued, a modified variant of the PDW-18 is the core of the PDW-9, and uses the same parts. This means that the PDW-18 will be indirectly supported until the PDW-9 is outmoded. An off-duty soldier demonstrates detaching the SMG-901's unique helical magazine - by the back first. The SMG-901, shown here as issued. 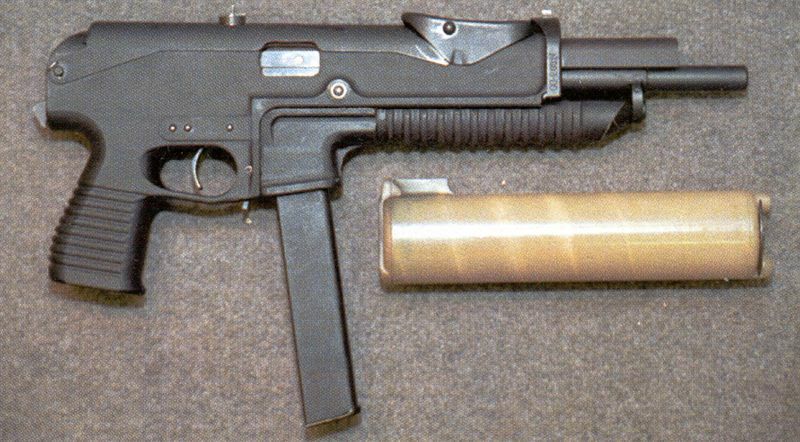 An SMG-901 with an adapter to fit a 32 round fast-loader magazine. The SMG-901 is one of the standard-issue sub-machine guns of the Spredronian military, the other being the SMG-1928. Because we said so, the SMG-901 is named for its classification as a sub-machine gun, and for its submittal design moniker - PP-90M1. The SMG-901 is effective to 200 m downrange, and fires 9x19mm Parabellum rounds. The SMG-901 can fit two magazines - the standard is a 64 round helical magazine, offering higher capacity than the PDW-57, but an adapter can be attached to load a 32 round fast-loader magazine, as seen in Fig. C. The weapon uses a V-notch-and-post iron sight setup, and fires at 600-800 rounds per minute, or 10-13 rounds per second. A semi-automatic fire mode is available for more controllable rounds. 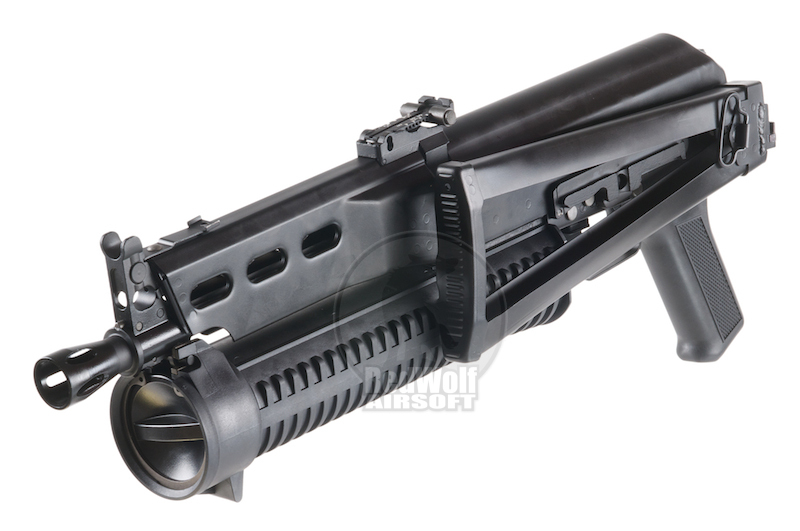 Though the standard SMG-901 does not have any attachment space, an accessory rail can be mounted to use optics, and the barrel can accept a Sound Supressor. The SMG-901 has outmoded its predecessor, the SMG-192, primarily as a visual upgrade; it only outperforms the SMG-192 in versatility (due to the Fast Loader) and fire rate. An SMG-1928 equipped with a Drum Magazine and foregrip handguard. An SMG-1928 next to the SMG-11 it replaced. Can you spot the differences? The SMG-1928 is one of the standard-issue sub-machine guns of the Spredronian military, the other being the SMG-901. This will also touch on the outmoded SMG-11. Though it is antiquated, the SMG-1928 is the oldest military weapon still in use with the Spredronian army - nobody can question its efficiency in mowing down enemies. Most models are shipped with the traditional wooden furniture, though they can be exchanged for modern rails at any time. In any event, the SMG-1928 is a lethal and effective weapon, named because it is a sub-machine gun like any other, and for the model it was submitted for - the SMG-11 was named after the M1A1 Thompson, and the SMG-1928 after the M1928 variant. The weapon feeds from .45 ACP rounds and is effective to 100 m, thanks to modern weapons-making techniques (the SMG-11 is effective to 50 only). The SMG-1928 can fit three magazines - the standard issue being a 30 rounder, with 20 round Fast Loader and 50 round Drum Mags available on request for Rangers and Marines. The weapon uses partridge iron sights, and fires at a dazzling 1500 rounds per minute, or 25 rounds per second - the fastest man-portable weapon in the Spredronian arsenal. Fortunately, a single-fire mode is available to converse ammo. Though the weapon is not shown to carry any sort of accessory rails, an optical rail and RIS system can be attached to the weapon to facilitate the use of attachments - though the gun can have its handguard switched out for a pistol grip, as in Fig. B, so the RIS is semi-useless. An SMG-192 equipped with a Sound Supressor and a Reflex Sight. The same SMG-192 from before, viewed from the opposite side. The SMG-192 is a service sub-machine gun of the Spredronian miltary that is being phased out. The weapon is named because of its designation as a sub-machine gun, and for the name it was submitted under - PP-19 Bizon-2. The SMG-192 is effective to 200 m downrange, and fires 9x19mm Parabellum rounds - exactly like the SMG-901. The SMG-192 can fit the same high-capacity 64 round magazine as the SMG-901, and fires at 650-700 rounds per minute, or 11-12 rounds per second - both areas where the SMG-901 outperforms this. The SMG-192 has a bead partridge iron sight system - essentially like the partridge system seen on other guns, only with a roughly bead-like front sight post (or, at least, enough of one to get the gun classified as a bead partridge-sighting weapon). As with most other weapons, the SMG-192 has a single-fire mode. Just like with the SMG-901, an optical rail can be attached to the top if optical attachments need to be placed onto the weapon, and the barrel can accept a Sound Supressor. In the end, the outmoding of the SMG-192 has been a bitter topic of debate - while, statistically, the SMG-901 does perform better, it only slightly edges by, and slightly enough to make some question the decision to outmode it in the first place. As with all other outmoded weapons, however, the SMG-192 will continue to be supported until working copies do not exist. A Ranger uses an AR-68, equipped with a 4x ACOG scope, a set of RMIS, a Laser Sight, a Foregrip and a Sound Supressor. A Marine uses another AR-68, carrying a Reflex Sight instead of an ACOG, and sans a Laser Sight. The AR-68 is one of the standard-issue assault rifles of the Spredronian military, the other being the AR-17. 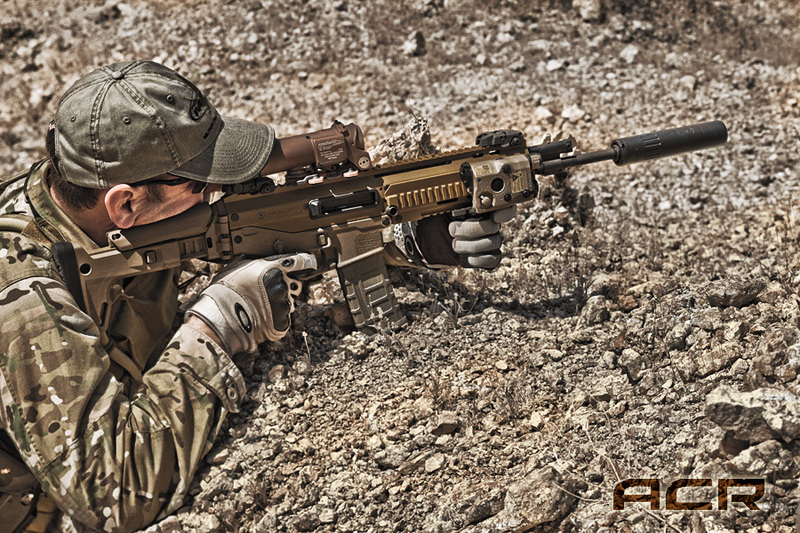 Displaying the usual system conventions, the AR-68 is named for its classification as an assault rifle, and for the 6.8mm Remington SPC ammunition it consumes. The AR-68 can shoot out to 350 m while retaining accuracy, and fits a 27 round regular magazine due to the increased round size - though a smaller, 18 round Fast Loader, a larger 42 round Extended, and a 95 round Drum are available to Rangers and Marines on request. The weapon's standard RMIS are ghost-ring iron sights, though others can be attached. The ACR possesses three-round burst and single fire modes, and fires on automatic at 800-950 RPM, or 13-16 rounds per second - also outdoing the AR-16. Of particular note is the reason the AR-68 outmoded the AR-16 - the AR-68 has quick change parts allowing for swapping of things such as barrels in less than two minutes without the requirement of specialized tools, while still retaining the usual durability that is expected with the weapon. When this is coupled with the multiple rail attachment points to accept anything that fits on an Accessory Rail, the AR-68 was quickly put in favor over the AR-16. Three Marines test the AR-17 (4x ACOG and Foregrip), the former AR-16 (Holosight, Laser Sight, and Foregrip), and an old AR-82 (Variable Scope, Supressor, and Foregrip) at a firing range. An AR-17 equipped with a Reflex Sight and a Foregrip, configured for close-quarters fighting. The AR-17 is one of the standard-issue assault rifles of the Spredronian military, the other being the AR-68. By the will of Cthulhu, the AR-17 is named for being an assault rifle, and for the moniker it was submitted under - the Mk. 17 SCAR-H. The weapon feeds off of 7.62x51mm rounds, and can fire accurately out to 600 m, making the weapon more of a battle rifle. It fits a 20 round magazine, though Rangers and Marines can get a 10 round Fast Loader, a 30 round Extended, or an 80 round Drum magazine for the weapon. The weapon has the front of a ghost-ring iron sight setup built-in, and the rear sight accomplishes this setup. The gun fires at 625 RPM, or 10 rounds per second, which is slow enough to make the AR-17 controllable. In addition, the gun possesses a semi-automatic fire mode for when marksmanship is required. The weapon outmoded its predecessor, the AR-58, because of its beefier recoil absorption ability, while retaining the same modularity the AR-58 possessed (four Accessory Rails) despite the latter rifle's higher fire rate. The AR-16, equipped with a Foregrip. Another AR-16, equipped with a Holographic Sight, a Foregrip, and a Supressor. The AR-16 is a service assault rifle of the Spredronian military that is being phased out. By the will of the Gods, the rifle is named because it is an assault rifle, submitted under the name "Mk. 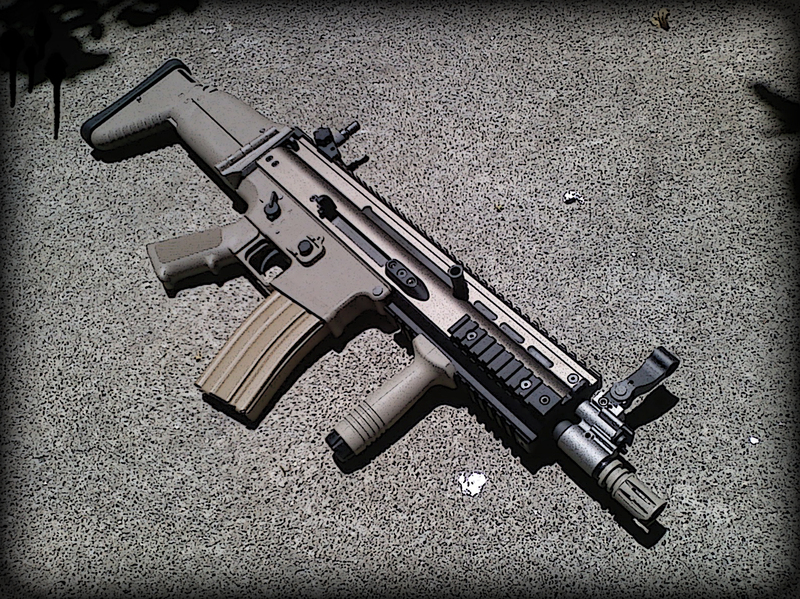 16 SCAR-L". The weapon can fire accurately out to 500 m, and carries a payload of 30 5.56x45mm rounds. The AR-16 fits a 30 round magazine by default, but a 20 round Fast Loader, 45 round Extended, and 100 round Drum are available to Rangers seeking extra flexibility with their firepower. The weapon has the same sighting system as the AR-17, and, in fact, both were submitted as nearly the same weapon - both possessing a large amount of parts commonality. The weapon, like the AR-17, fires at 625 RPM, or 10 rounds per second. There are four continuous rails to place different attachments on the AR-16 if so desired. The weapon was outmoded by the AR-68 because the latter has a higher fire rate, carries higher caliber rounds, and has more modularity, thus outdoing the AR-16 in the categories it entered under. Despite this, the AR-16 still shares a very large amount of parts with the AR-17, and until there are no more working copies of this gun in the military, the AR-16's specific parts will continue to be manufactured.